Guitar scales are a complex, yet crucial aspect to any advanced guitarist. Having a knowledge of these scales will help you become more of a well-rounded and expert musician. Not only will you become more versatile, but you will be prepared when rocking out with your buddies, because you’ll know what to play and when to play it. Here is what is called a scale chart, and is good for reference. This particular has three branches of scales, a major and minor for each, and a few variations in each branch. At the top we have the major and minor scales. The major scale is the foundation of every other scale and chord to be built upon. It is very basic and is typically one of the first scales you should learn. What makes major scales so unique is that they contain all the notes you need to make a chord in that particular scale. Natural minor scales are very similar to major scales. The only difference is that you must start and stop on the 6th note of a major scale. In the middle are the major and minor pentatonic scales. The major pentatonic scale is a scale that is played over most natural major scales, and only has 5 notes within it, hence the prefix “penta”. The minor pentatonic scale only has 5 notes, and is typically played over natural minor scales. This scale is mostly used during guitar riffs and soloing due to its unique sound. Finally we have the major and minor blues scales. These are my favorite scales, mostly because I love blues and jazz music. The major blues scale is very simple to play, because all you do is add the 3rd flat note from the major pentatonic scale. 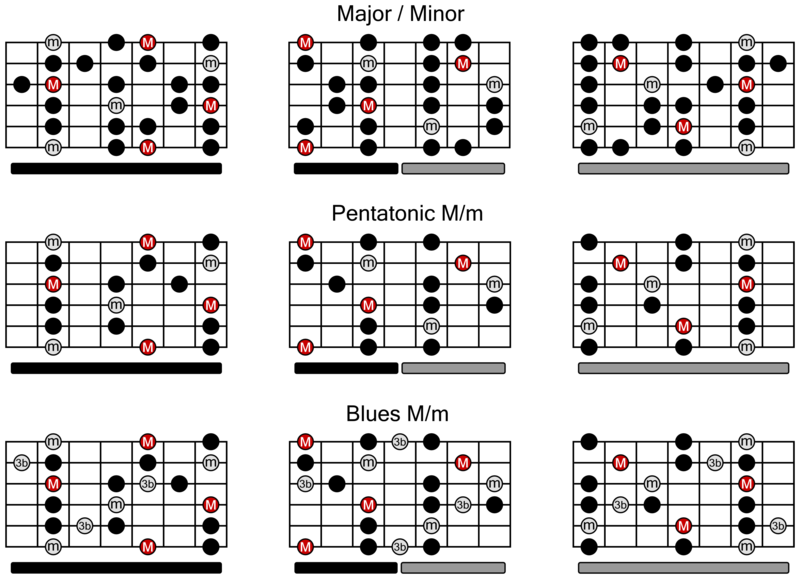 If you look at the chart, you’ll see how the blues scale is merely an extension of the pentatonic. The minor blues scale works in a similar way. However instead of adding the 3rd flat, you add the 5th flat of the minor pentatonic scale.